The designers started with a Steinway Model A-III which was in production from 1912 to 1942. 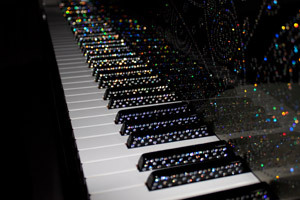 Their unique piano — dubbed “New York Serenade”—pays homage to America’s swing years, to the likes of the Glenn Miller Band, Count Basie, Gershwin, and the indelible stamp they left on New York City. Etched onto every surface in cubic zirconium are the Big Apple’s recognizable landmarks: Central Park, Brooklyn Bridge, Steinway Hall and Harlem’s legendary Cotton Club, which once played host to some of the best jazz and swing performers in the country. The artistic inspiration, according to Katherine, came from the period 1920’s - 1940’s when the Art Deco movement and the Swing era of jazz flourished in New York City. “The piano tells a story,” Katherine said. “The goal was to create a very complex sequence of images in a very elegant way .” The 164,000 individual stones took Korolev and Katherine 16 months to put into place. They also installed Live-Performance Model LX, which is a wireless system that confers with an iPad to play a “very extensive selection” of tunes—including classical, jazz and modern music—at the push of a button. 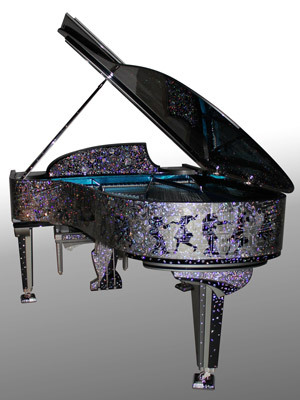 The 164,000 jewels that decorate the piano’s surface are cubic zirconium, individually placed over the 16 months. 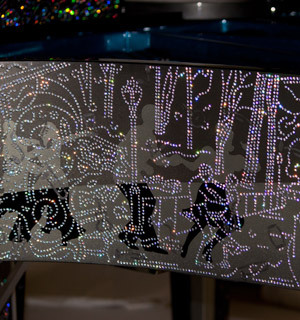 The New York Seranade is Piano Solutions XXI’s third custom piano, though Korolev has been restoring pianos since he was 17. 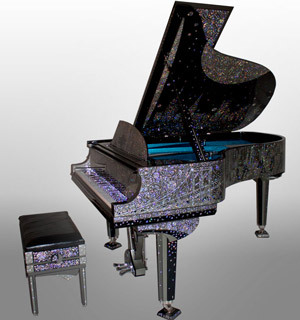 The two branched into piano design only five years ago and have designed only two other pianos—a Coco Chanel tribute and a Harley Davidson-inspired piece—before the New York Serenade. The piano is not currently for sale—Katherine says she is looking for “the right buyer”—but she expects that when the piano does sell, it will be for over $1 million. The couple on the piano dances through the swing-era icons of New York City, including the Cotton Club and Steinway Hall. The piano is not currently for sale—but when it does sell, Banyasz estimates that it will be for over $1 million.